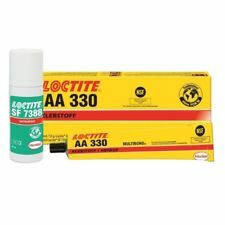 Loctite AA330 Pale-yellow, general purpose structural bonder which is ideal for bonding dissimilar substrates like PVC, phenolic and acrylic compounds. LOCTITE® AA 330 is a no-mix, pale-yellow, general purpose structural bonder which is ideal for bonding dissimilar substrates like PVC, phenolic and acrylic compounds. It is a medium to high viscosity product that has good impact resistance as well as a service temperature range up to +100°C. It requires an activator, LOCTITE® SF 7388.